All concerts enjoyed free of charge at the Romolo Chocolates outdoor piazza, 1525 W. 8th St..
Romolo Chocolates Heats Up Erie With Its 2016 Summer Music Series. 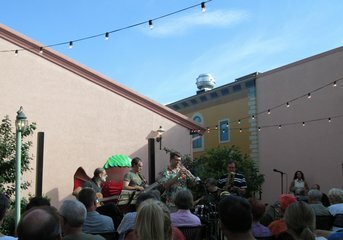 All concerts enjoyed free of charge at the Romolo Chocolates outdoor piazza, 1525 W. 8th St.. All concerts 6:00 -- 9:00 p.m. This concert series has become a favorite for Erie fans because of the high quality and exciting variety of musical offerings. Not to mention the classical beauty of Romolo's outdoor Piazza setting. Best arrive a little early, plan to spend a few minutes parking and get a good seat, or bring your own. Great ice cream soft drinks, chocolates are available in the store before or after the show or at intermission. Lots to enjoy! Jazz harmonizing with African rhythms and blues soul. He rocked the house on trumpet for CALJE last year, and now he’s back with his own trio to light up Romolo Chocolates with contemporary and Latin jazz. From 6 to 9 p.m. on Saturday, July 30, Victor Garcia blows trumpet with Charles Heath blazing the drums and Andrew Lawrence jamming on the organ. After a recent stint playing with bluesmen, Garcia adapted his playing to reflect that genre also. “I just wanted to sound more soulful than ever,” he says. This will be the last event in Romolo's 2016 Summer Concert Series.